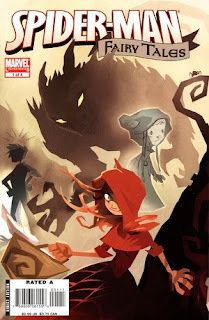 This retells four fairy tales and myths from around the world, using the cast of Spider-Man. The blurb on the back states that it is' re-imagining the greatest Spider-Man stories through folktales, myths and fables from across the globe!' As a casual Spider-Man fan I only spotted one specific Spider-Man story woven into these myths, so don't be put off by this text. Set in an alternate, near future world, college student Sophie Bangs is researching Promethea stories for a school project - Promethea is a recurring character in many different pieces of literature over the centuries. Sophie tracks down and meets with the widow of the last writer to focus on Promethea. At this meeting Sophie discovers that there once was an Egyptian girl named Promethea, and furthermore, when Sophie writes poetry about Promethea, that is when she uses her imagination to connect with the idea of Promethea, she becomes her. Moreso, there have been Prometheas created like this, before her. Sophie as Promethea gains mystical powers and can travel to a realm called the Immateria, a world of myth and fiction where ideas have reality. 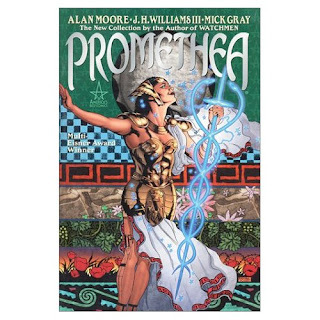 Within the Immateria Sophie learns about the history of Promethea and is trained for battle with the demons who are out to destroy Promethea and all her vessels. The Muppets: a collections of pigs, frogs, dogs and… things. Together they run a small variety theatre complete with songs, sketches, stand-up routines, backstage shenanigans and pessimistic hecklers all presided over by history’s most put-upon impresario: Mister Kermit The Frog. 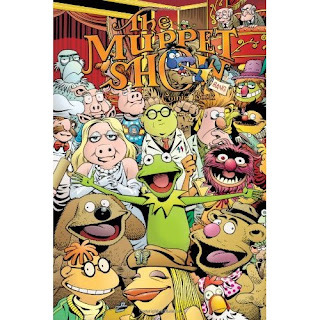 The Muppet Show Comic Book resurrects the classic children’s programme in a new format, suitable for all ages. 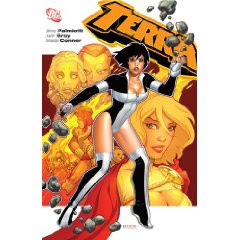 This trade collects Supergirl issue #12, featuring this Terra's first appearance, and the four issue Terra miniseries released in 2008/2009. This collection serves as an introduction to the latest character to the Terra name. This is the third character to be named Terra, all have powers over rock and earth. As an introductory volume, we learn more about who this Terra is, where she comes from and what her relationship to the previous Terra's is. She comes up against a power hungry bad guy who has been turned to diamond by a mysterious pool located near the middle of the earth, fights all manner of monsters from beneath the earth's crust such as lava creatures, and makes friends with certain surface dwelling superheroes. It's basically a get to know you volume. Penny And Aggie follows the relationships of a large and varied group of American teenagers. Aggie is a budding activist, socially conscious and outwardly quite emotionally mature. Penny, meanwhile, is Aggie’s chosen arch-enemy: a rich, spoilt and outwardly selfish popular girl. If that all sounds stereotypical (and it does, I admit it) then rest assured that over the years the two characters grow and change: Penny is not the monster Aggie initially believes her to be and neither is Aggie as perfect as she believes herself to be. Steven T. Seagle, professional comic writer, is offered a stint on the Superman book. For most comics creators, this is the ultimate honour and indicates that they have 'made it', however, Seagle turns it down. the reason he gives is that Superman doesn't resonate with him. 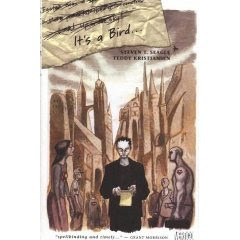 We discover that Seagle's first exposure to the Superman comics occurred in a hospital when he was five years old, and discovered his grandma had a rare degenerative and fatal disease, then named Huntington's Chorea.The rest of the book deals with Seagle's examination of what Superman means to him, what the spectre of Huntington's means for his future and his family. In Spring 2003, a pride of lions escaped from the Baghdad zoo during an American bombing raid. This book tells their story, from the perspective of the animals involved. 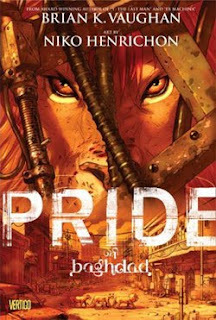 There are four lions in the pride. Zill, the patriarch, Safa, an old lioness who relishes the safety and care provided within the zoo, Noor, a younger lioness with dreams of freedom to be found outside the confines of the zoo, and Ali, Noor's cub. He is young, eager and enthusiastic about the world. During the bombing raid the zoo is hit and the lions are forced to leave their home and venture out into the city. Once out, they discover more about humans, the war and the difficulties surrounding life on their own. The animals symbolise the innocents involved in this war, and other wars. The only humans we see are two Iraqi zookeepers, featured briefly at the start of the book, and the American soldiers, again appearing briefly, at the end of the book. 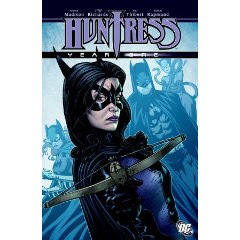 Helena Bertinelli is the Huntress, a costumed crimefighter with no superpowers, operating out of Gotham. 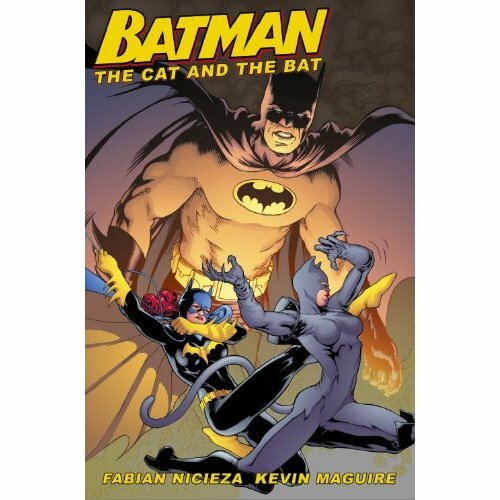 She has worked with Batman, Batgirl and other notable characters in the DC mythos. She is the daughter of a high ranking Catholic mafia family, and when she is just a young child, 8 years of age, a mafia hitman comes to her house and shoots her father, mother and brother in front of her. She is then packed off to Gotham and is brought up in another family's house, until the age of 21 when she can claim her inheritance. Joel: a Canadian graduate teaching English as an additional language in Korea and hating every minute of it. The first chapter opens with a brief narration examining culture shock as one of the natural stages by which a person adapts to another culture and then presents us with Joel. Joel is a man seemingly trapped (perhaps by his own design) within his own culture shock, as he tries to decide whether to stay in Korea for another year or return home to his own culture and sanity. There are several ways you can navigate around this site. Menus on the right and left of the screen contain useful posts that serve as good starting points. Click through to read more. 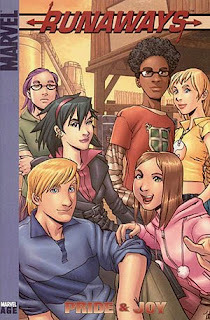 Runaways is set in the Marvel Universe and is about a group of 6 teenaged kids who find out that their parents are supervillains. The kids range in age from 11 year old Molly Hayes to 17 year old Chase Stein. Upon finding out the truth about their parents they decide to run away and try and make up for their parents mistakes. Along the way the kids discover if they powers, learn to work together and are forced to mature and become independent far quicker than they’d anticipated. Note: This picture is from #1 of the monthly series, but I believe that the trade will have the same artwork. Simply put, this is a retelling of the Supergirl story. It's aimed at younger readers but has been loved by many adults too. Twelve year old Kara Zor-El crash lands in Metropolis, thwarting Lex Luthor's evil plans and meeting bumping into Superman at the same time. 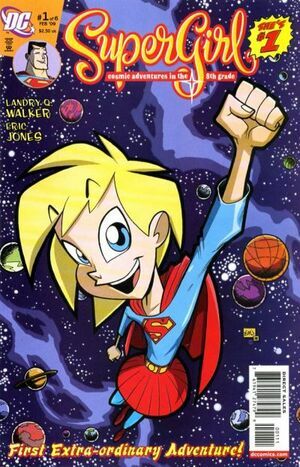 Upon discovering little Kara is his cousin, Superman enrols her in Stanhope boarding school and gives her the secret identity of Linda Lee. She must learn about earth ways, make friends and navigate her way through the eighth grade. Along the way she encounters evil doppelgangers, duplicitous best friends, super intelligent feral cats, time travel, flying horses, meteor induced superpowers and the possible end of the world. Batman Confidential: a series exploring “famous firsts” in the Batman mythos that never really got around to happening but were just originally assumed to have done. In this case, the first meeting of Batgirl and Catwoman. Batgirl: Barbara Gordon, daughter of Batman’s longtime ally Police Commissioner Jim Gordon. Too short for the police academy, she takes to fighting crime as Batgirl. At this point in her career she’s just starting out and won Batman’s respect a grand total of three weeks ago. She’s also stolen her father’s coded notebook to see what secrets it contains. Diana, Princess of Themyscira, aka Wonder Woman, is Ambassador for her people. This story mostly takes place in and around her embassy in New York. 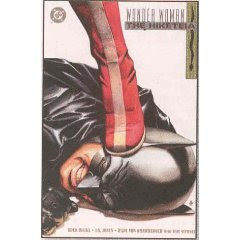 A young woman, wanted for a string of murders in Gotham, runs to Wonder Woman and gives supplication to Diana in order to form Hiketeia with her. Welcome everybody, to this new project with the lofty aim of recommending comics to people who have never read one before, or who haven't read one for a long time. We will cover superheroes, manga, alternative and web comics. We will not recommend anything where it is necessary to know decades of continuity. We will only recommend books that are available in a trade (collecting 6 to 8 of the monthly magazines) format so that you can get them from regular bookshops. We are keen on people using their local comic book shop but understand that they can be somewhat intimidating if you've never been in one before. To aid this, there will be a list of recommended local comic book shops made available. We will aim to avoid comics with sexist, racist, homophobic or ableist overtones or intent. If there is some background to the comic, the writer or the art team that could contradict this policy, the issue will be mentioned and discussed within the review. The contributors are Saranga, James Ashelford and LissBirds, with occasional guest reviewers. For more information on either of them please visit their fun and lively blogs for the latest thoughts of the day. For further information on what this site is trying to achieve please read this intro post and look at the Aims, objectives and information box located at the top right of the site. The first book to be reviewed will be about Wonder Woman and we will be also be covering books that would make great Christmas presents, so be sure to Follow us or stop by at a later date to see what else has been posted. I hope you enjoy, please leave comments on the posts and let us know your opinions! A directory of good, trusted and friendly shops to buy your comics in, should you require it. This will be updated as and when we discover good stores. If you have any tips for us, including ones outside of the UK, please leave a comment and we will add the information to the post. Hi, maybe you’re here because a friend has recommended the site to you, maybe you’ve stumbled across this from a search engine or maybe you got here from another blog. This is a site about comics. It’s intended as a review site for those people who have never read a comic before, or maybe not read one for a long time, and are interested in finding out more but don’t know where to start. One person to do the pencils – draw the outlines of the characters and background scenery. One person to do the ink – they render another artist's pencils in India Ink. They also do the shading on comic art, the black bits on the finished artwork. One person to do the colours – literally, the colours on the art. They fill in the bits the inker and penciller hasn’t. One person to do the letters - that is, the text in the comics. Different lettering styles have a huge impact on the way you perceive the characters and the mood of the story. America has two major publishing companies – Marvel and DC. Marvel are responsible for the X-Men, Spiderman, the Fantastic Four, the Hulk, Iron Man, The Avengers, Captain America, Daredevil, Elektra, The Punisher, Ghost Rider. DC are responsible for Superman, Batman, Wonder Woman, Green Lantern, the Flash, Aquaman and the Justice League.